Customers can now receive real-time updates as they design and modify conveyor systems when using 3D Preview in DTools, Dorner’s online conveyor configurator. 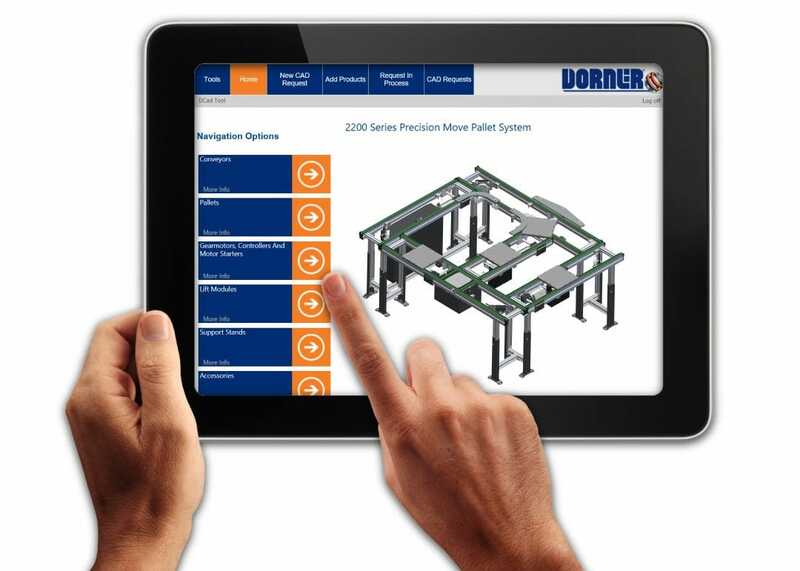 3D Preview, a fully interactive, live experience for customers that gives them more information than ever before, is now available for Dorner’s 2200 Series Precision Move Pallet System. When building their conveyors in DTools, a 3D CAD model is simultaneously developed to match their designs. As the conveyor is modified, the configuration updates to correspond with those changes – giving customers live updates and rotatable 3D views of their conveyor systems prior to submitting them for quotation. The 2200 Series Precision Move Pallet System conveyor is designed to increase efficiency and reduce downtime in various assembly automation processes. The platform can carry pallet loads up to 70 pounds around 90° or 180° corners, and pallets can be accumulated in a corner; an advantage not typically seen in most corner systems. It also features a tight transfer 180° corner that creates a loop with only 135mm between main run conveyors. This cost-effective option uses the Dorner Pin Tracking system, which eliminates the need for other transfer devices while maintaining pallet orientation through the loop. 3D Preview will be available on Dorner’s other conveyor product lines in the coming months. For more information on DTools’ 3D Preview, visit: https://tools.dornerconveyors.com.